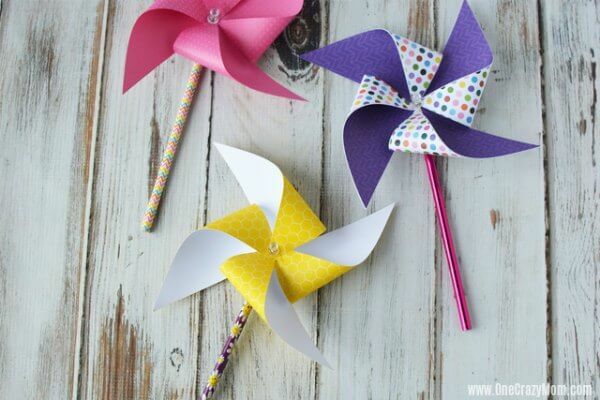 Learn how to Make Paper Pinwheels with just a few supplies. These are so fun and whimsical! 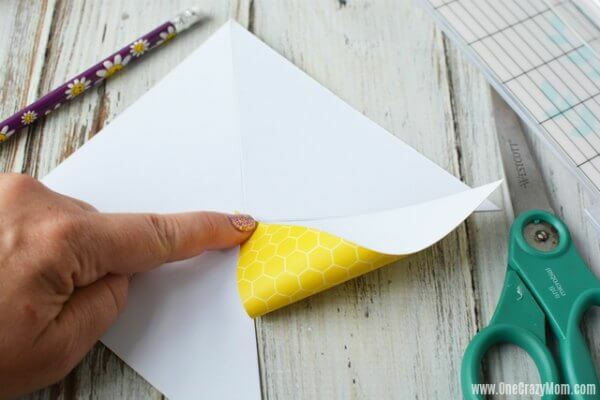 You can make an adorable paper pinwheel in just a few minutes. We love to make an assortment of colors and designs. The kids have a blast selecting the paper they want to use. It’s fun seeing how each pinwheel turns out. I used card stock for these and I think it would be easier with just regular decorative paper. The card stock worked fine. However, it will be easier to push the pin through the center of the paper if it’s paper and not as thick as card stock. 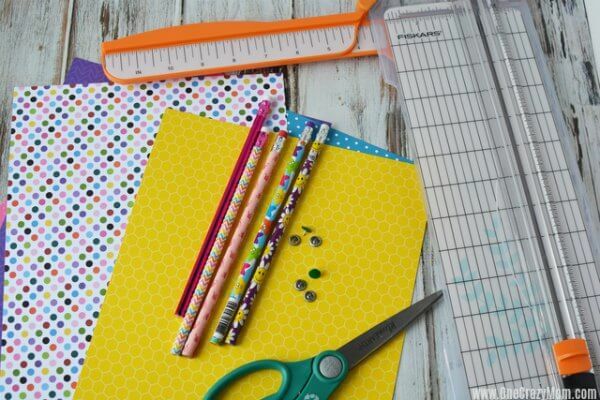 I bet you could even use scrapbook paper. Plus, those come in so many different fun designs and colors. Also, the longer push pins worked better with card stock than the smaller push pins. If you’re struggling not to cut into the center of the pinwheel, you can use a quarter and trace it in the center. Just make sure to stop when the cut mark reaches the center circle. 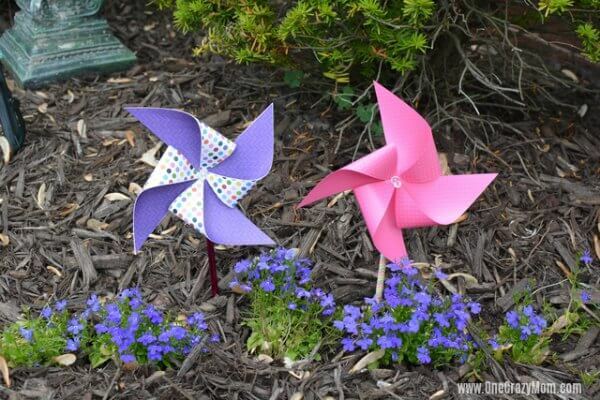 For the two color pinwheels (purple and polka dot) I used 2 pieces of paper . I lightly glued them together before cutting and shaping into a pinwheel shape. 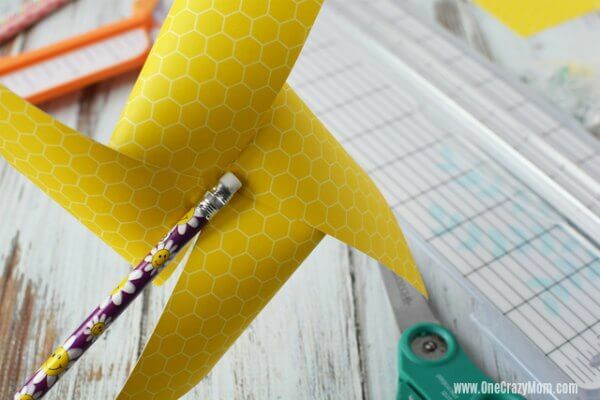 Let’s learn how to make a paper pinwheel craft! 1. 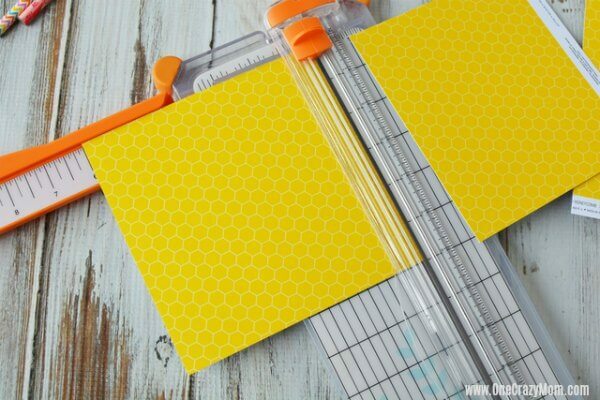 Use the paper trimmer to cut a 6″ square out of the decorative paper. 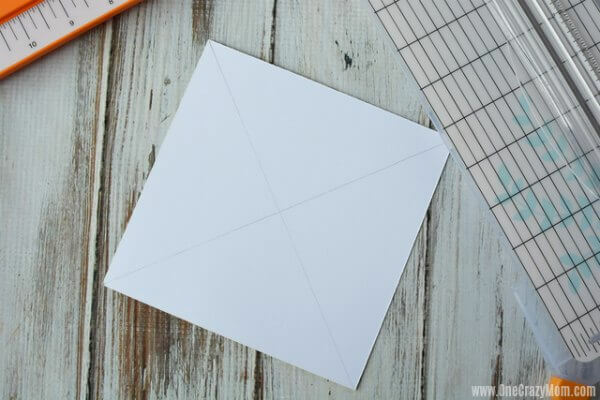 Use a ruler and pencil to drawl light lines from each corner of the squares to create 4 triangles. Cut on each of these lines almost to the center. Leave about 0.25″ uncut before the center cross mark. This will be your paper pinwheel template. 2. 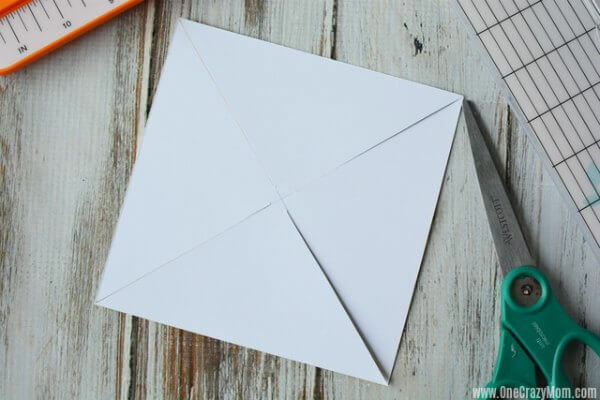 Carefully place a small amount of hot glue in the center of the paper. 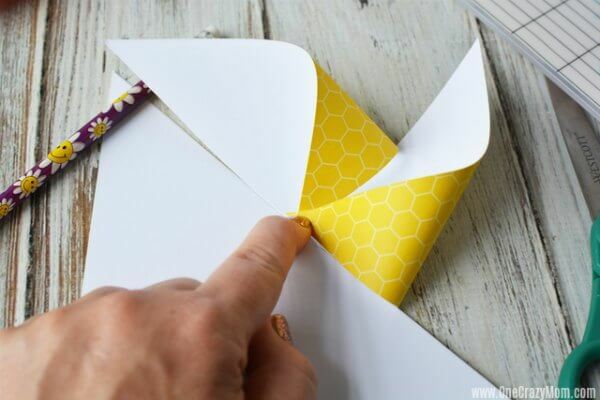 Bring one corner of the diagonal line to the center of the paper and hold in place until the glue keeps it there. Continue, bringing in each triangle to the center and attaching it with glue to every other point. After bringing it corner to corner, set aside to dry completely. 3. Once the glue is dry, press a thumb tack into the center of the pinwheel. Press this into the unsharpened pencil eraser and enjoy. Making pinwheels out of paper is so fun! The kids will have a blast helping to make this fun craft. 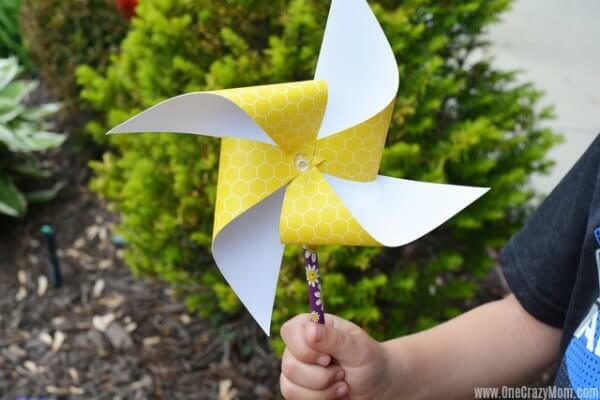 Bring every pinwheel outside to see how they work! 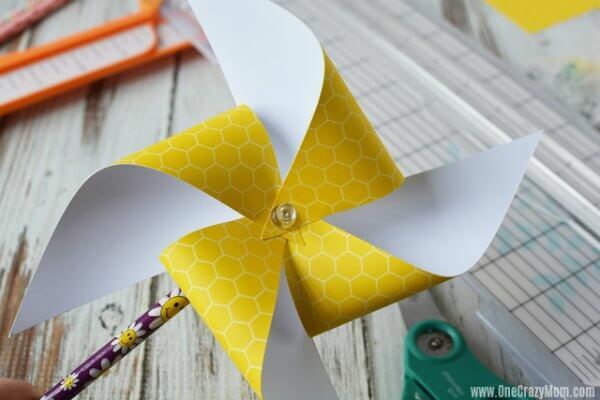 Paper Pinwheels DIY is so fun and simple! 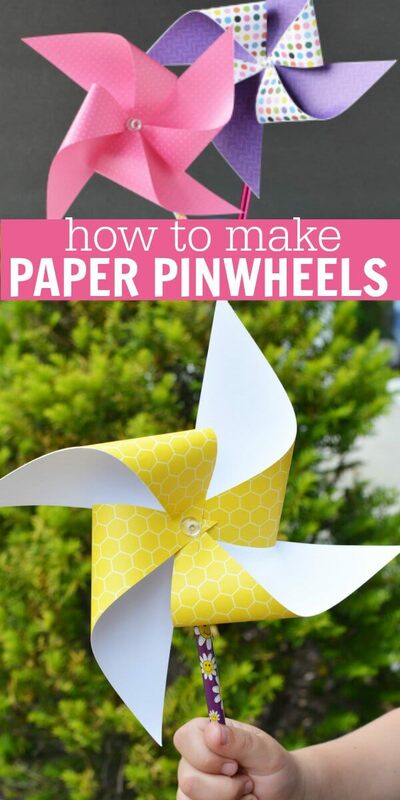 You can also try to make a Paper Plate Pinwheel! 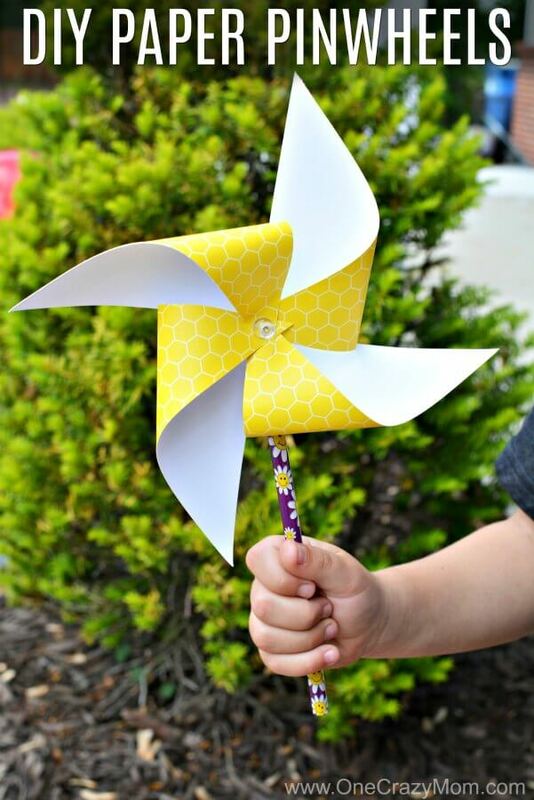 Another fun idea is to make paper plate wind twirlers. So fun! 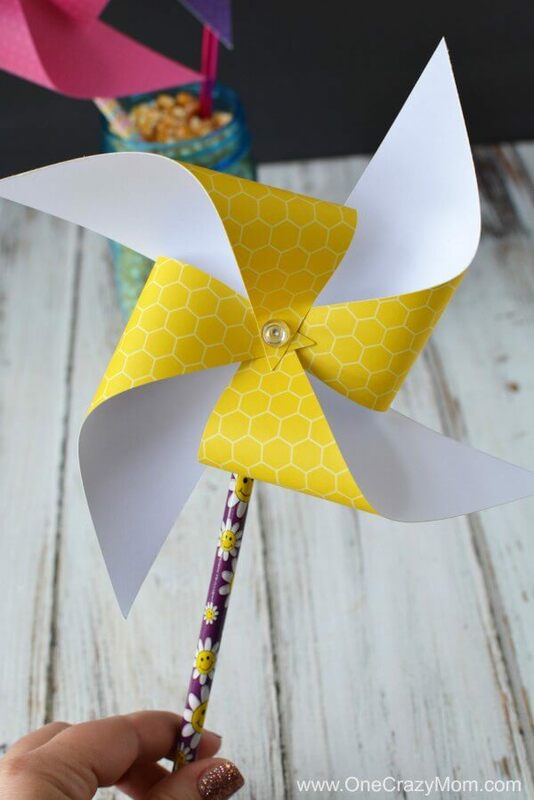 Do you know how to make a pinwheel with a straw? If you don’t have any extra pencils, try using a straw instead. They are not quite as sturdy but they work just as good. 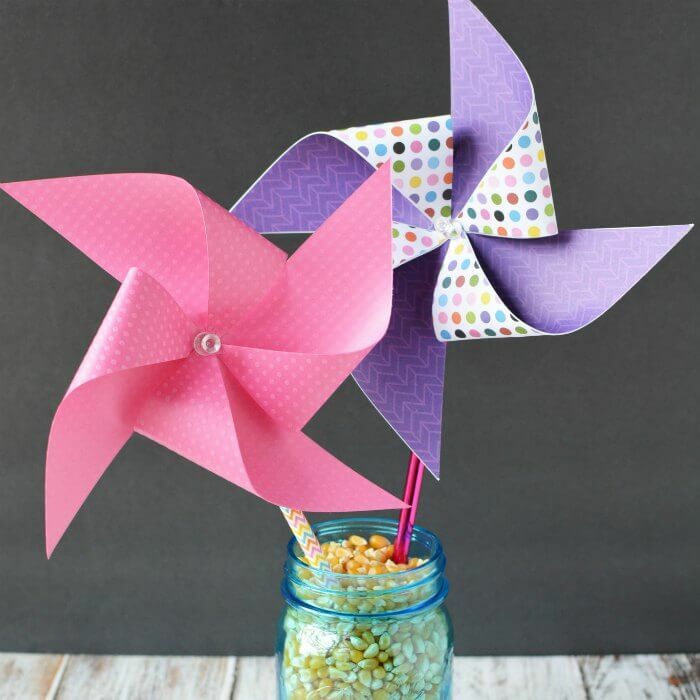 Now that you know how to make paper windmill fans, try making lots of different colors! We love how fun and easy these are to make. If the kids enjoy making these, try making DIY Wind Chimes for another fun activity. We also really like to make these DIY Bubble Wands. No need to spend tons of money on expensive craft projects. We enjoy lots of simple projects that only take a few minutes and little money to make. I bet you could even use a small bead in the center to decorate these even more. They would be gorgeous party decorations. Not only would they be so pretty for the party but they could also double as party favors. Each child can take home a paper pinwheel after the party! I love items that pull double duty. It saves money and time. Plus, less to clean up after the party. I think these would also be just gorgeous for a baby shower. You could make a bunch of pink or blue ones depending on the shower and it would be so festive. Yellow, purple or mint green would be really pretty too. The options are endless. 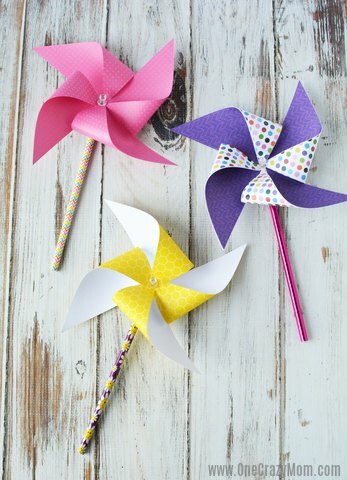 The kids will have a blast making these fun and whimsical paper pinwheels. Each one will reflect the kids personality and it will be neat to see how each one turns out. Let us know how your pinwheels turn out. I think everyone will have a blast making these. These look so classic and just perfect for any occasion. Or no occasion at all! They are perfect to make just for fun. We also love to watch Amazon prime kids movies to give the kids something fun to do indoors when it’s rainy or too hot outside to play. I made some in different sizes out of card stock, and I have laminated them, thank you so much for the instructions! !